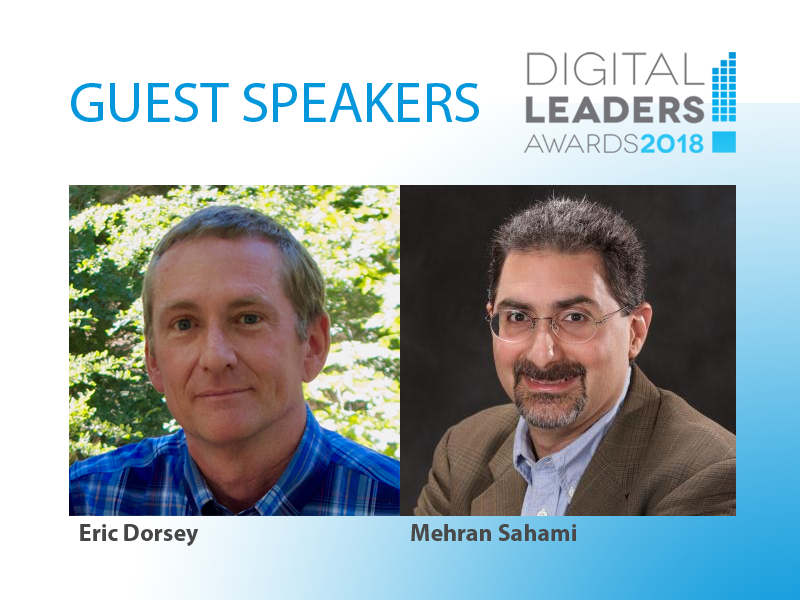 As the Digital Leaders Awards event draws nearer, we are excited to announce this year’s speakers: Eric Dorsey and Mehran Sahami! Both are Stanford grads, and Dr. Sahami has returned to the university as the Professor and Associate Chair for Education in the Computer Science department. Eric Dorsey, recently VP of Engineering at TiVo, led a team in 1985 to create the technology that would give Dr. Stephen Hawking a voice. In 2009 Hawking’s technical assistant contacted Dorsey to see if he’d be able to “transplant” the 30-year-old voice synthesizer, which Hawking refused to abandon, into modern technology that would last. For nearly 30 years Hawking was able to share his ideas and thoughts with the world using the original Call text technology. Now the product was obsolete, without spare parts or knowledgeable programmers to tweak and fix the code. The equivalent of an archaeological dig and reconstruction took approximately three years to newly enable the same voice. Mr. Dorsey will share audio clips, photos and stories from both the original device delivery and most recent mission impossible. It’s a fascinating tale revealing how strongly we identify with our technology and the power of what it enables. Visit the SF article to preview the story. Professor Sahami is interested in understanding computer science education through a social justice lens. In this article, he discusses the advancement of technology and its ramifications if done without consideration of ethics. Recent unauthorized use of extensive personal information has brought this concern to the mainstream. With the ongoing potential to alter society, technology regulation has become a trending topic on social media and in classroom discussion. In 2014, he received the ACM Presidential Award for his work in developing curricular guidelines for college programs in computer science at an international level. He recently has collaborated with other top institution professors to develop curriculum on computer ethics. His talk is certain to be relevant and thought-provoking. Both speakers approach the role we have to play in integrating humanity with technology from different perspectives. Community Tech Network’s mission is to promote digital literacy as a human right, an ideal that pervades the work of Dr.Sahami and Mr. Dorsey. Please join us in celebrating the contributions our award-winners have made to bridge the digital divide in their communities and hear interesting perspectives from two speakers addressing the digital divide for one person and the “big picture” future. Enjoy fine wine and delicious bites while hearing the stories of these remarkable people. Get your tickets now – Early bird pricing is available through April 20th!